So many people across the globe fulfil their life-long dream with us to photograph the Wild White Horses of the Camargue. You can’t beat the adrenalin rush of this noble breed splashing through the shallow waters of the marsh and beach. The workshop includes each of our different Wild White Horses shoots – running in the marsh, running on the beach, sparring stallions and single stallions on the beach, in the sea & surf and rearing on the sand dunes – making for spectacular award-winning shots. This workshop is an Equine and Wildlife photographer’s dream. We will collect you from Montpellier airport for transfer to your charming hotel in the centre of the medieval town of Aigues-Mortes. Take time to unwind, unpack and perhaps explore the narrow streets of the city that lies within the mile-long rampart walls. At 6pm, we will gather for a welcome drink and briefing meeting. We head to the beach for the first shoot of a beautiful white Stallion. We photograph him dashing and diving in and around the sea and surf, as well as rearing on the top of the sand dunes, making for a wide range of dramatic action shots. Late afternoon, we photograph the Wild White horses running through the marsh. We shoot several drives with the horses running across and towards your field of view. We will also take shots of the ‘Gardians’ (Camargue Cowboys) dressed in their traditional Camargue shirts & hats, trident in hand, surrounded by the herd as well as some close-up portraits of the ‘weathered’ ranchers. In the morning we have another session with the horses running together through the shallow waters of the lakes but with a different composition and location. After the action, we then take portraits of the horses on their own or in small groups. Late afternoon, we head to the beach for the ultimate spectacle of the white horses running along the golden sand and in the sea as the sun sets in the surf spray! 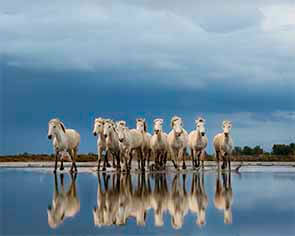 We also capture the horses in a peaceful lagoon with beautiful reflections. In the morning, we have the final session with the white horses running through the marsh with a different composition again. We will also capture the ‘Gardians’ at work herding the wild horses. Late afternoon, we head back to the beach for the second shoot at the lagoon and on the beach and in the sea.